Copyright, 1891. by Frank Harding. Words and Music by Tony Farrell. Arranged by Wm. Loraine. And I know that he's quite happy with children by his side. And an income that will keep him from all harm. And this dear old friend he asked me if I thought they could be foes. Those emblems of the three united nations. Why should they be rivals? Why should they be foes? Why despise the tree for the fruit that it grows? What difference is there in the shamrock, thistle, or the rose. Those emblems of the three united nations? Those sweet, contented flowers in that pretty little house. My mind upon one thing I'll ne'er forget. When the mouse he freed the lion from the net. 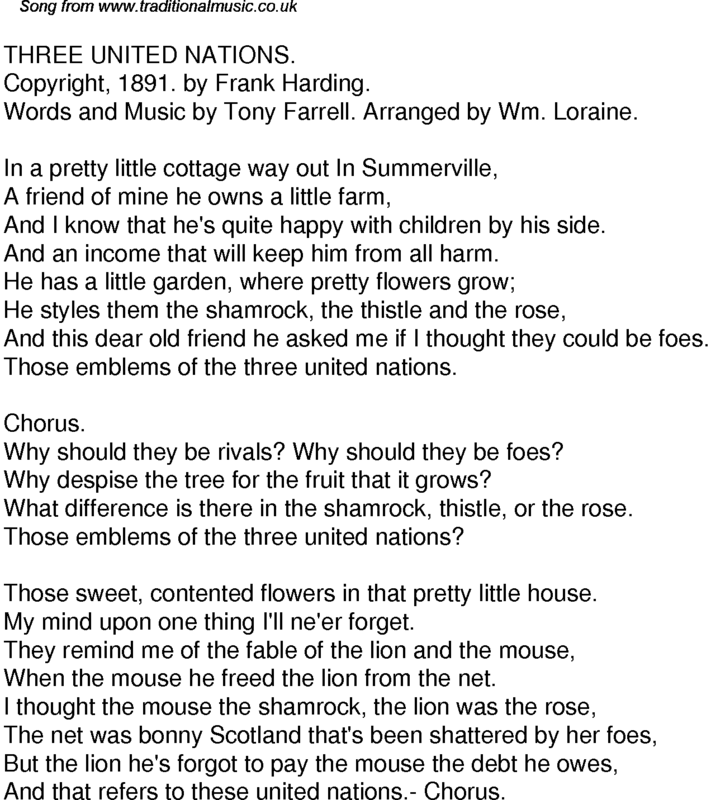 And that refers to these united nations.- Chorus.